At the F.W. Vanderbilt National Historic Site in Hyde Park, the restored formal garden is a jewel in its own right, while also a haven for a wide diversity of pollinators. The garden was restored in 1984 by a group of volunteers with permission from the National Park Service. Today, the gardens are still maintained by volunteers of the Frederick W. Vanderbilt Garden Association, Inc., a not for profit organization dedicated to rehabilitation and maintenance of these beautiful gardens. The garden is a fine example of formal gardens and provides a wide diversity of flowering plants that attract not only bees but butterflies and wasps. Looking at the Pool House from the Cherry Walk. 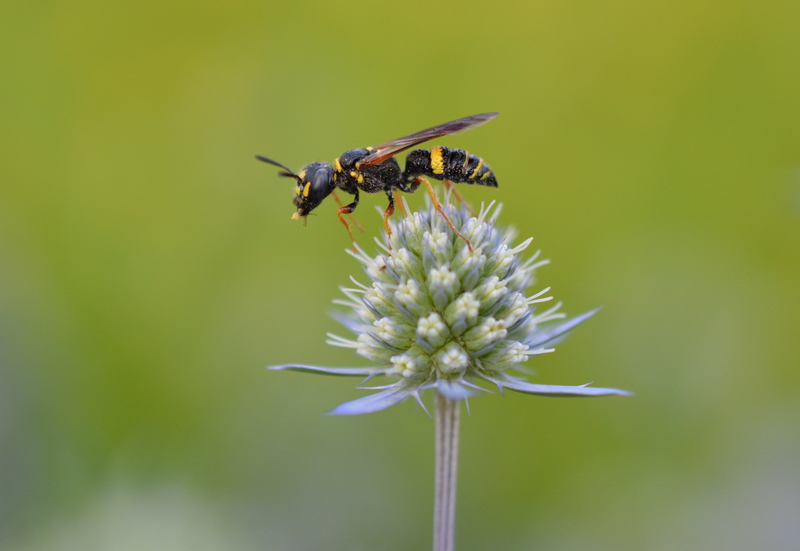 One of plants of special note in the gardens is Sea Holly which was heavily visited by pollinators, especially a wide variety of wasps including: grass carrying wasps, great golden digger wasps, sand wasps, mason wasps and potter wasps. 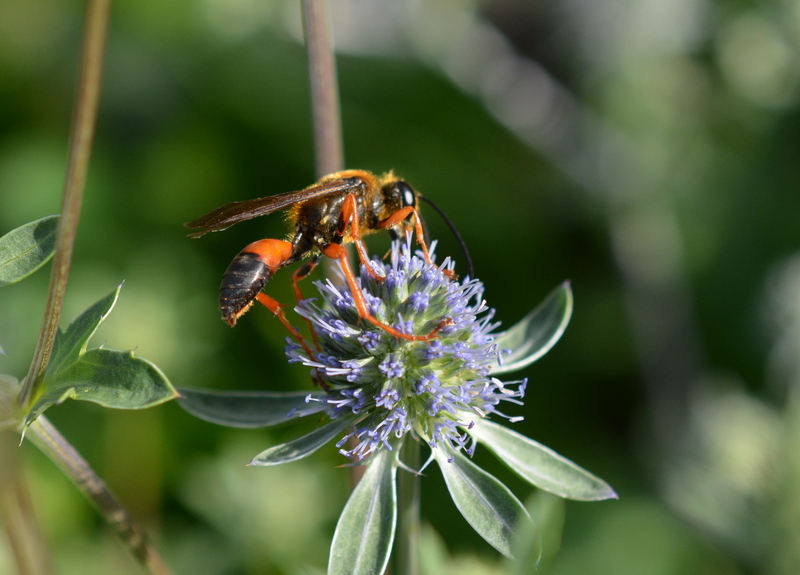 All of the solitary wasps are non-aggressive and enjoy feeding on the nectar of flowers. 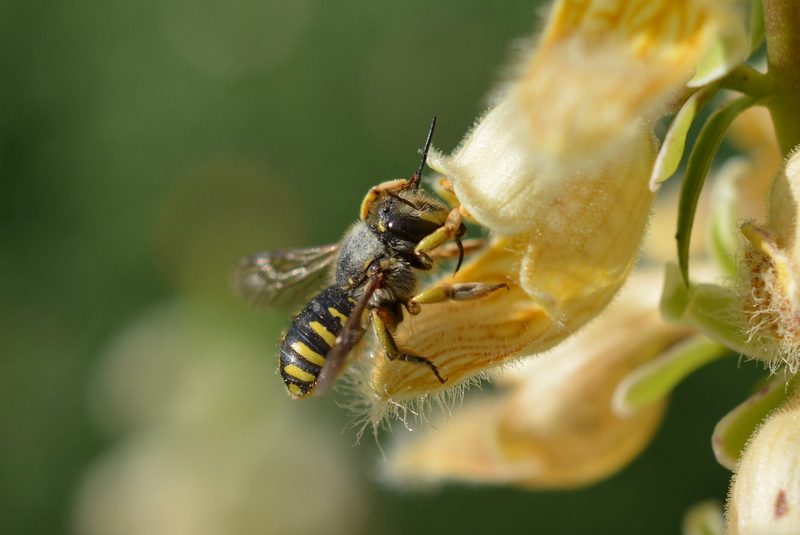 Most wasps are predacious and feed their developing young insects whereas bees feed their young a mixture of pollen and nectar. 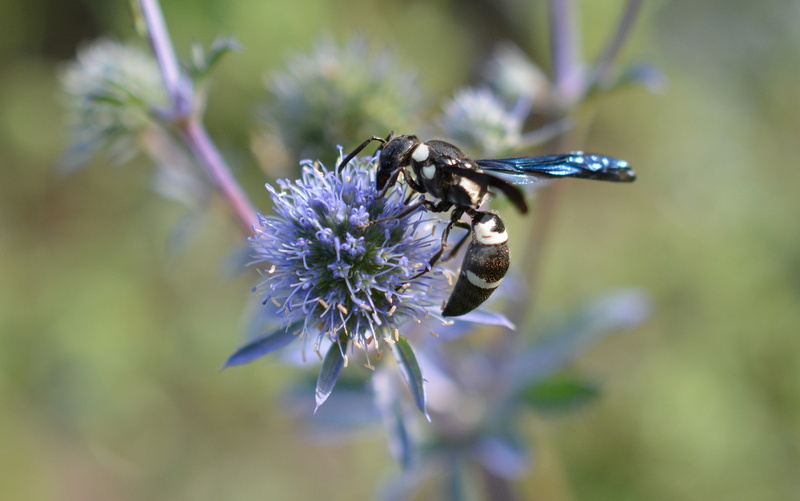 Note the blue tinged wings of this mason wasp. 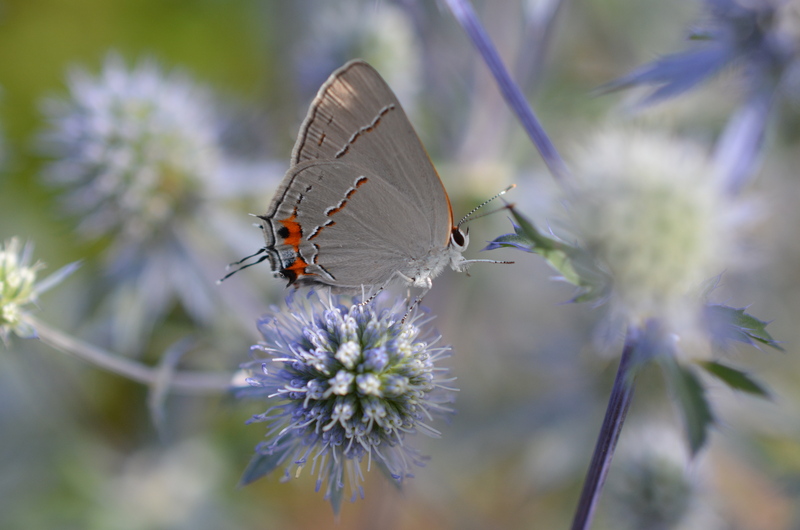 Butterflies also enjoy the sea holly flowers especially the gray hairstreak which a common but beautiful butterfly. The foxglove was very busy with a few species of bees, but the wool carder bee was enjoying this flower the most. 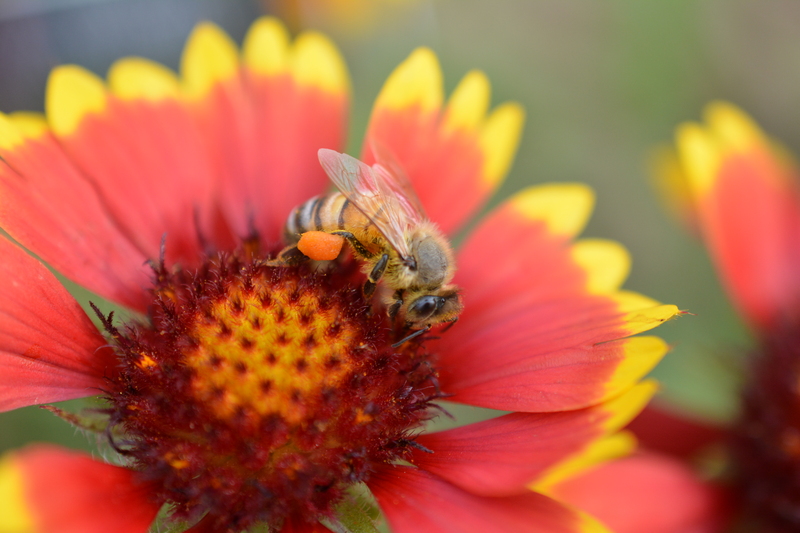 The males, unlike other species of bees are actually larger than the females and were actively pursuing the females as they were busy collecting pollen and nectar. 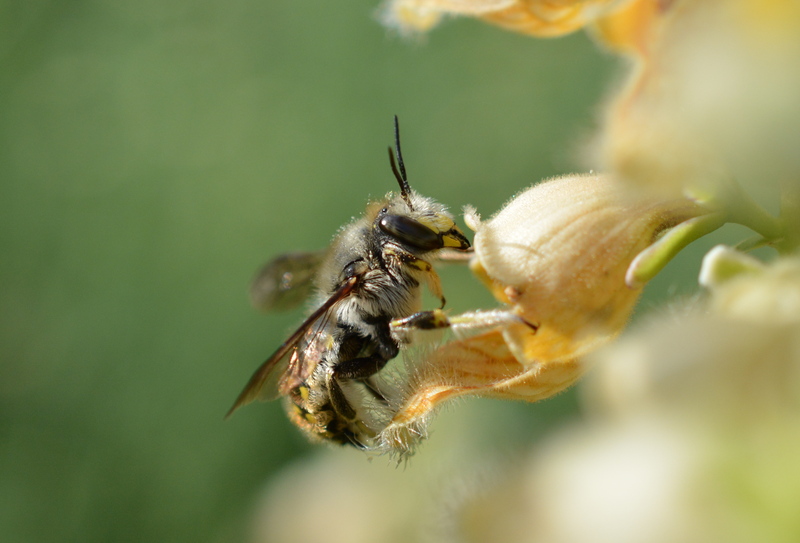 The wool carder is in the genus megachile and like all species in this group collect pollen on the hairs of their abdomen. 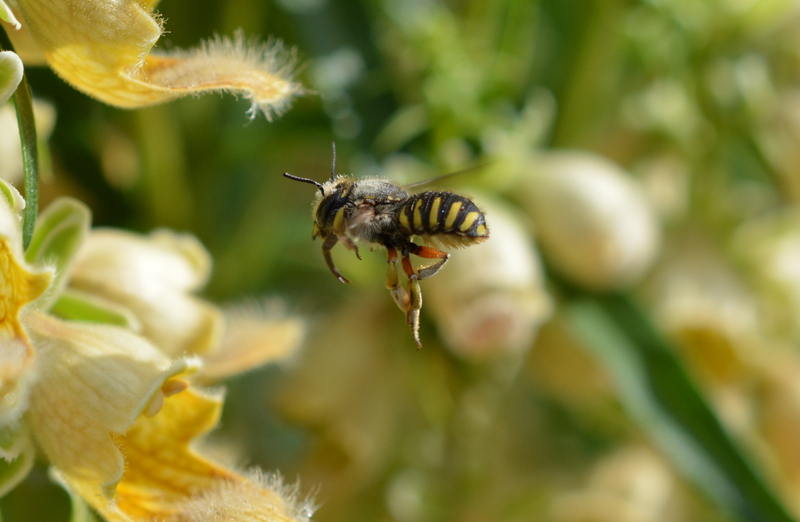 Other bees in this group include leaf cutter bees and the blue orchard bee. 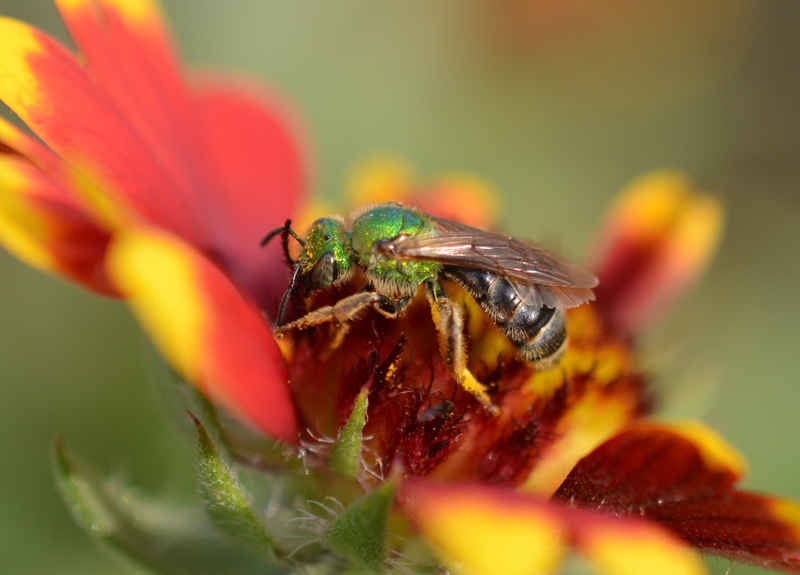 The green sweat bee was very active on many of the flowers in the garden but in particular frequented the gaillardia, aka blanket flower. This flower is a member of the sunflower family and native to North and South America. Honey bees, bumblebees and a variety of sweat bees enjoyed the sweet rewards of this showy blossom. Throughout the gardens bumblebees were visiting almost all the species of flowers in blossom. The confusing bumblebee which is mostly yellow was very common. 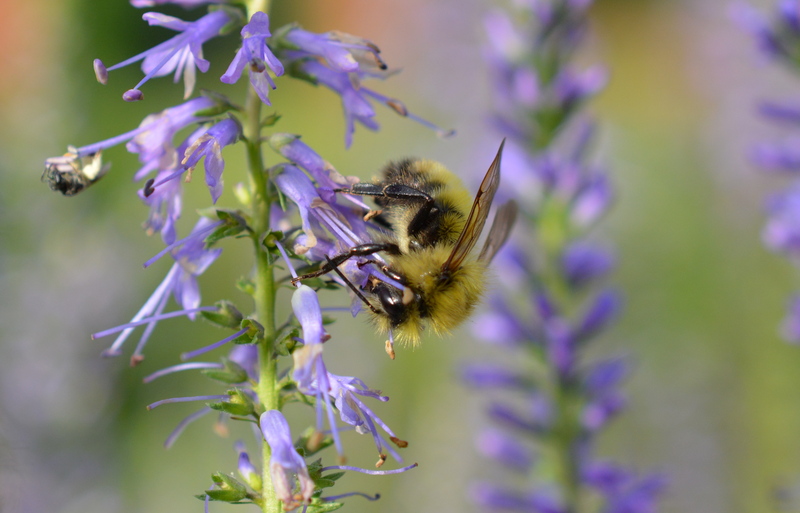 Bumblebees are generalists, foraging on a variety of different flowers. Interestingly, different species of bumblebees have different tongue lengths from short to long. This is believed to help eliminate some competition among species. Of the four most common types I’ve seen in the Hudson Valley they all have medium tongues. 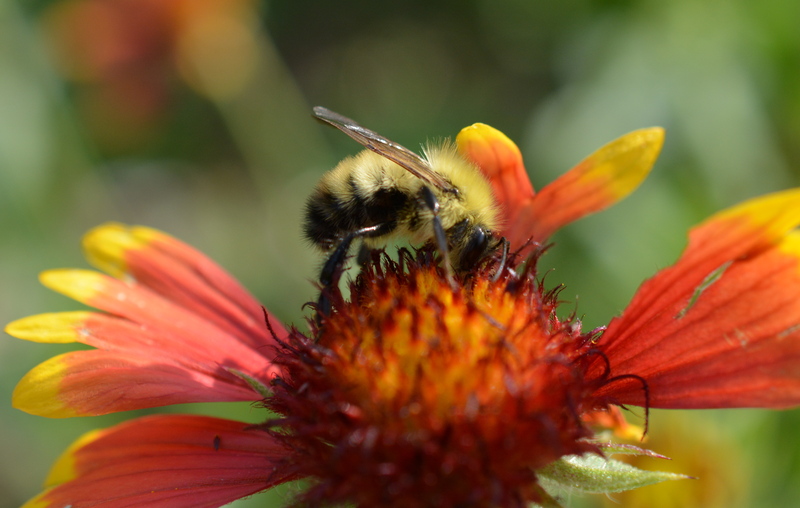 These include the: brown belted bumblebee, confusing bumblebee, common eastern bumblebee and the two spotted bumblebee. 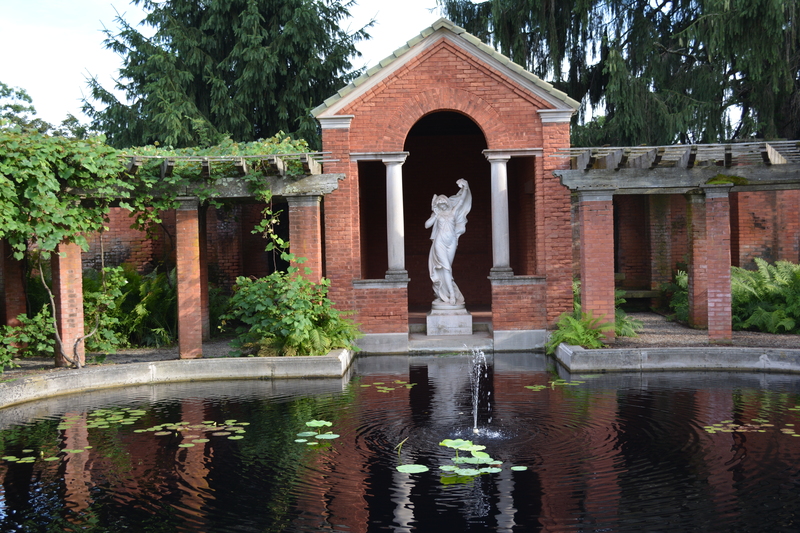 Throughout the Hudson Valley formal gardens can be found around many of the mansions and homes that were constructed during the gilded age. 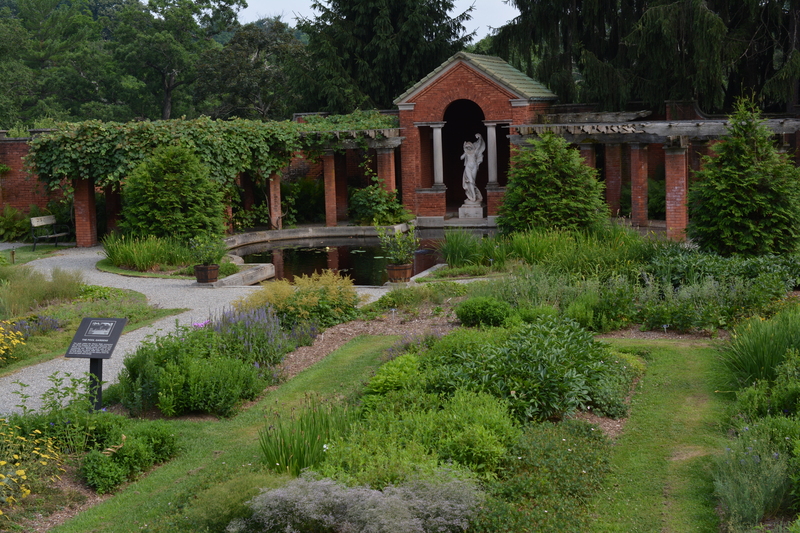 Other sites in the Hudson Valley where you will find formal gardens include: The Home of Franklin D. Roosevelt, Locust Grove (Samuel Morse House), Clermont, Kykuit and Olana. Beyond the small wonders that are busy at work pollinating flowers is the beautiful landscape of the Hudson River with sweeping views of the Catskill Mountains.